Preston North End defender Tommy Spurr’s loan spell with Fleetwood could be coming to an abrupt conclusion. Spurr went on a season’s loan to the League One side in the summer. But he’s not played since the end of September due to a hip injury and has been back at North End having the injury assessed. There is a chance that Spurr will need surgery and that would cut the loan short. But even if he doesn’t, any sizeable length of absence may see Fleetwood try to cut the loan short. Town boss Joey Barton is certainly talking in terms of Spurr not going back to the Fylde coast. Barton said: “I have not seen Tommy for a bit, he has gone back to Preston. “Tommy did have that in the background, it has flared up and I will be surprised if he plays for us again. “I think he has to sort that out at Preston. “He is back there, we need to touch base with him. Spurr hasn’t had the best luck with injuries over the last couple of years. 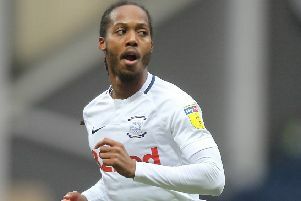 After largely being a squad player in his first season with North End after joining on a Bosman from Blackburn, he got his chance in the back four when Alex Neil became manager. He started last season in the centre of PNE defence before being edged out by Ben Davies. But Spurr then suffered a medial ligament injury in a bounce game at the training ground and was sidelined for four months. His only first-team game since then was February’s 1-1 draw at Brentford. In the summer Spurr was widely expected to leave, with Jordan Storey having arrived to bolster the options in the centre of defence. So it came as something of a surprise that his move away was only a loan deal, albeit for the full season which takes him to the end of his contract. If he requires an operation, PNE have the duty of care to him as he is still contracted to them. Spurr has played seven times for Fleetwood.